Domestic novelty to the lovers of stone and minerals on a site. 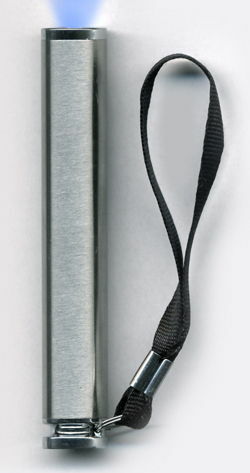 On a photo a modern ultraviolet light-emitting-diode pocket flashlight is represented with the schematic image of radiation of ultraviolet, giving the even circle of ultraviolet of small area and reasonable power of radiation in a midrange. Small, placed in barsetke, Kharkov, Ukraine, CIS (produce recently). Ultraviolet-light-emitting diode LED 385 nm. Comparatively new type of light-emitting diodes in their 5 mm corps. Light of such lantern is visible poorly, but due to a wide spectrum in Ultraviolet-area illuminate from beneath the different types of domestic luminophore. From 2010 - collecting popularity diagnostic light Ultraviolet-radiation LED instrument (flashlight), in-use including for diagnostics of stone and minerals in home terms. Relatively safe, can be used as a detector of currency, to authenticity of documents, exposes latent images in the ultraviolet marking (on bank cards, marking of aggregates), facilitates the search of holograms. Also Ultraviolet-flashlight LED off wild animals in darkness, used for departures on nature. Removable battery of "AA", look like a small fountain-pen. We offer to the collectors and lovers of stone and minerals of Ultraviolet-flashlight for diagnostics by ultraviolet luminescence and on departures on deposits. Safe in home and domestic terms, including for home animals (brief use). The metallic corps of flashlight is ideal on departures, in quarries, on kimberlitakh. Luminescence is the light phenomenon of visible an eye light of stone and minerals under the action of ultraviolet radiation. Luminescence is a fantastic spectacle, when in darkness red, rose, dark blue, yellow spots flash in the pieces of breed. In an order to see this phenomenon, it is possible to use an ultraviolet light flashlight for verification of currency and money. In size they are a less (and safer) laser pointer which does for sight. The best of all to look after light luminescence at night and in darkness - on seeing light of it is difficult. Reasons of light luminescence. When on the ion of atom a photon or quantum of light (and energy of photon or quantum radiation is in an ultraviolet higher of energy of photon of visible daylight) falls in the crystalline grate of crystal, his energy and parameters of oscillation in the knot of crystalline grate changes. As a result, nearby ions change the position in a crystalline grate. On it energy, revealed to the ion of atom by a photon and quantum of light at a hit in him, is outlaid, that results in lowering of energy of initial ion (blow). A photon and quantum of light is thus emitted with less energy and, consequently, with less frequency which can be distinguished with a naked eye in a visible range. Process of loss of energy. Daylight is "collapsible solyanka" of electromagnetic radiations, in particular, visible light and ultraviolet. Therefore in the day-time we see mixture of color of mineral and luminescence periodically, if there is additional ultraviolet (A sun, sea, lamps, sunburn, solariums, manicures, manufacture). Most simply luminescence light of minerals is observed in ultraviolet rays radiation in darkness. Luminescence light of stone in ultraviolet is used also for a search and enriching of minerals. For example, lentu-konveer with a mountain breed which diamonds are in, light up ultraviolet and hands choose diamonds, luminous brightly-blue, chlorine or yellow or by other light. Diamonds burst in a stove at a high temperature. A wolfram-contain mineral shines blue scheelite. Uranium radioactive and very dangerous for the health of micas shine green, yellow-green et cetera It is a dangerous production scienter. Why do some minerals sometimes shine in light ultraviolet? Researches rotined that luminescence is created by chemical elements and atoms, having the not completed electronic shells of atoms (elements-luminogens). We will look in the periodic table of Mendeleyev and will see that it is metals groups of iron, which relatively easily lose electronic shells: actually iron (trivalent), manganese, chrome, tungsten, molybdenum and uranium. And also rare-earth elements are a lanthanum, scandium, yttrium, cerium and other radioactive. 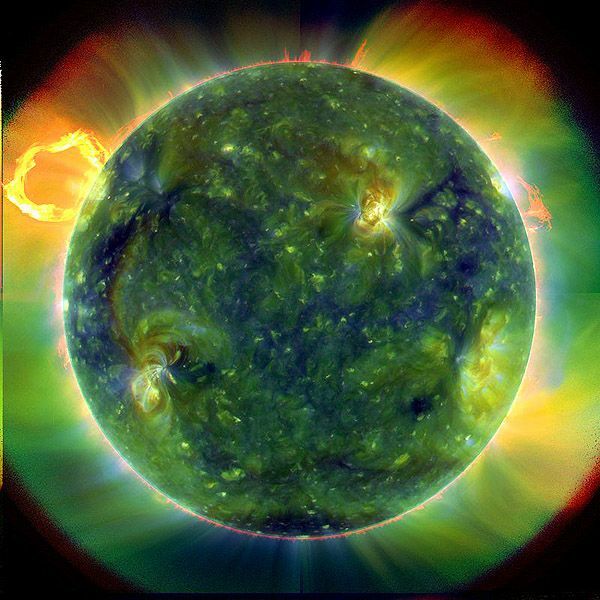 The ultraviolet is caused by excitation of electrons, and their vibrations result in the radiation of hertzian waves of different length - light which we and visible. From an irradiation ultraviolet of eye of people in an eye can shine and observed extraneous elements (retina them videt), and in an apartment a dust shines sometimes. A paper and fabric can fluoresce. Some prospectors specially collect luminous in ultraviolet, unattractive in the usual light, stone. Ultraviolet, neither short-wave (KV), neither medium-wave nor long-wave (DV) - usually not visible an eye. And lamps light blue (violet), because they, along with ultraviolet, save visible part of spectrum. An ultraviolet (he is named ultraviolet) is an electromagnetic radiation, occupying a spectral range between the violet area of visible spectrum of light and x-ray photography radiation, therefore it additionally exposes the hidden structure of stone in darkness (radiation from beneath). In 1801 the German physicist of Iogann William Ritter began the search of radiation outside the violet area of visible spectrum. After the row of experiments with fotorazlozheniem of chloride of silver, was found out an ultraviolet and used including for the exposure of invisible inks. Part of daylight-lamps dark blue range ("cold light") is partly emitted ultraviolet, him much in mountains, on glaciers, in Antarctic Continent, on oceans. To see luminescence, a man needs the special device, emitting an ultraviolet - Ultraviolet-flashlight (LED and other). Recently an interesting novelty - light ultraviolet flashlights appeared on sale. They work on light-emitting diodes, exposing the light ray invisible an usual human visible ultraviolet spectrum. Such lanterns are as pocket or nalobnykh devices, miniature brelokov and stationary devices. Stationary (and dangerous) ultraviolet lamps set in jars and cashdesks for checking of money notes for authenticity. Comfortably to use the small flashlights of pocket type in everyday domestic life. Many polymers, in-use in consumer goods, degrade under the action of Ultraviolet-light (LED), on ultraviolet react row of varnishes for a modern manicure. A problem shows up in disappearance of color, dimming of surface, rastreskivanii, and sometimes and complete destruction of good. We recommend a metal. The popularity light flashlights with ultraviolet light purchased after the invention of fluorescent paint and hairs of documents. Exactly it is reflected in an invisible eye light ray of lantern. Purchasing such device, you will be able to use him as a detector of different matters, sensible to Ultraviolet light. More frequent than all ultraviolet flashlights are bought for verification of authenticity of money. As is generally known, a few difficult degrees of defence have paper notes of contemporaneity are decorative patterns, protective hairsprings, metal-backer bars et cetera Majority from them possesses ability to shine different tints under an ultraviolet with a certain wave-length. However needed it is to possess knowledges about the degrees of defence of notes, as modern forgers are well able to counterfeit difficult defence even. For verification of loss of workings liquids in cars and other mechanisms. To conduct such diagnostics, it is necessary preliminary to add an a bit fluorescent paint to the necessary liquid. Motorists use ultraviolet lanterns for verification of the anticreeper marking. Some flashlights, possessing sufficient power, it is possible to use in speleologii and geology - for a search and determination of minerals and mountain breeds. Additionally to close a lantern glass, special black colour filters and coverages, if he is included and works, not recommended - it will not be visible, a flashlight is included or not. A battery or accumulator will run down at the best, in worst are burns of derma and eyes ultraviolet. On nature fear sharp stone, precipices, steps of kimberlite quarries and kimberlite pits, failures. They usually are not visible in darkness. Diamond. C: blue, chlorine, yellow, orange, red. Aragonit. Ca[CO3]: white, green, yellow, cream, bluish-white, red, orange. Apatite. Ca5[(F,Cl,OH)|(Po4)3]: orange, yellow, brown, red, cream, white, violet, bluish-grey. Bustamit. (Mn,Ca)3Si3O9 : sometimes bright red. Calcite. Ca[Co3]: red, white, green, blue, orange, violet, purple. Kakholong. The white fallen off: rose, reddish. Corundum (ruby, sapphire). Al2O3: bright red, purple, orange, yellow, KV: blue. Kuncit (rose spodumen). LiAlSi2O6: intensive raspberry. Flyuorit. CaF2: blue, violet, white, red, yellow, cream. Zircon. Zr[SiO4]. KV (weaker in DV): bright-yellow, orange. Scheelite. Ca[Wo4]. KV: white-blue, cream, yellow. Spinel. MgAl2O4: red, DV: green, blue. Chalcedony. SiO2 (impurity): white-blue, sulphur, brown. In addition, separately recommend in the shops of optics to sale special colourless and not toning, without coloured napyleniya sun-blinkers from ultraviolet, without diopters for seeing without glasses ("zero diopter") - not superfluous, power of lamps is small enough although, to cause the real harm a health (carrying glasses with glass lenses can be glad - through usual glass lenses the weak ultraviolet does not pass). Although on glaciers, in mountains, in powerful solariums and at the seaside of usual glass and stand an optics and glass is not enough. For protecting of eyes from influence of ultraviolet the special sun-blinkers, staying a to 100% ultraviolet and sometimes transparent in a visible spectrum, are also used. The lenses of such glasses are made from the special plastics or polikarbonata. For the supervision of luminescence the ultraviolet of lantern is required (but not infrared rays). If we want to see luminescence (there is luminescence and not only in the range of visible light), for its excitation a radiation, possessing greater energy, will be required, what visible light. In the special scientific laboratory for the same purpose we can avail by other sources of excitation - x-ray photography and electronic rays, luminescence of mineral here will become brighter. Such devices are inaccessible an amateur - they are bulky, very dear and require exceptional precautionary measures (dangerous). Use ultraviolet lamps in which under constraint there are pair of mercury. At the key-in of electric current they emit visible light and invisible ultraviolet light. If to close a lamp the special black colour filter which detains visible light, and the ultraviolet skips, we will get the simplest device by which it is possible not long to study in darkness "minerals-fire-flies". It is impossible to carry large Ultraviolet-LAMPY. In darkness of it easily to break up. A few histories, related to the displays of luminescence, are known in geology. Self this phenomenon was described the Italian alchemist Kashiarolloy in 1602. He tried to get gold from a "heavy spar" - barita and paid a regard to that after prokalivaniya barit acquires surprising ability to "stock" sunbeams, and then to "return" them as luminescence are phosphorescences - during a few clock. In 1935 soviet geologist N. A. Smolyaninov first by a luminescent lamp opened the ore deposit of scheelite on territory of the CIS (ex-USSR). He looked over the standards of a stone and mineral material, brought from Tadjikistan (Middle Asia, CIS), from the township of Chorukh-dayron, and noticed in these pieces the accumulations of scheelite (ruda on a tungsten - Ca Wo4) which discovering a simple eye extraordinarily hardness. A scheelite is a hard and heavy mineral. His main difference is bright flyuorescenciya by a bluish-white color; sometimes, in connection with the presence of molybdenum - yellow. In ultraviolet rays flyuoresciruet a color from bluish to rather yellow. Night-clubs (night club), discotheque, diskobary, casino, other dancings and similar establishments use light Ultraviolet-LAMP Blacklight often. It is visible and invisible on the light radiated by them modern ultraviolet lamps, similar on a construction with the luminescent lamps of different constructions. They are often used in the detectors of currencies, and also in registration of night-clubs and ball-rooms. Especially popularly in the USA and similar states with the developed industry of dancings entertainments. Often the peak of dancings evenings is exactly the ultraviolet radiation from beneath of hall and dancings in complete darkness. Luminescence in ultraviolet can be most different and bright - all of flowers of rainbow. More faithful, luminescence reminds the bright neon fires of city: yellow, dark blue, red, violet, green... You want to be modernly selected on disoteke - buy jewelry and stone with Ultraviolet-light (light-emitting-diode flashlight). It is usually accepted to take with itself inexpensive fosforiciruyuschie breloki, toy skeletiki, symbolic figurines of stars, logotypes, pendants, toys, souvenirs of different form, miniature figurines of beasts, which can decorate tanczal, paints for a body, bodi-art and fosforiciruyuschie tattoos, - but in the USA sometimes for this purpose take on dances and diamonds. Diamonds luminesce different flowers, including white and blue light (the dearest in the USA), and they are specially bought with Ultraviolet-LED search poyarche. In Ukraine (CIS) will take for this purpose rubies (possibly, synthetic - they blood-red at light luminescence), vanadium alexandrite corundums (they are scarlet-red in ultraviolet) and sapphires (difficult in diagnostics, can shine crimson and red light "as rubies"). Blue cyanites are popular - they change a color also. Quartz-hairworm with the goldish oxide of titan by a rutile ("Hairs of Venus") from a gently-goldish stone under the action of light ultraviolet to grow for a time into a claret-red stone, reminding a bovine eye. Cornflower gently-blue and dark blue sodalit Priazovye of Ukraine (CIS) will become violet-red, reminding an enigmatic stone - violet charoit from Russia (Transbaikalia), CIS. The white opal of cakholong with the green mossy including in light ultraviolet becomes look like rose rhodonite rhodonite with black dendritami manganese (stone-character of Russia, Ural). The milk-white moonstone of adularia with a blue ebb (character of innocence) in ultraviolet light can become look like a "episcopal stone" is a violet amethyst (catholic church) and seems more transparent (on 50%). It creates problems and on a custom - one stone in the ultraviolet light successfully imitate sovreshenno other. Opals and amber are popular - especially opaque and with including (fosforiciruet green and white in ultraviolet). White and light agates sometimes awfully will change the color in ultraviolet (on beige, brownish, ominous rather yellow, color of bone et al). Industry spinups. Dangerous radio-active uranium micas is popular - they very brightly shine in invisible light ultraviolet, when usually turn off visible light for a while, by bright yellow-green, green and yellow light, actively fosforiciruyut. These radio-active stone are popular for fosforiscencii and luminescence. Sverkhpopulyarno everywhere.